Gibraltar is the second largest Lego spaceship I've built. Starship Gibraltar in space with accompanying F1 Fighters. 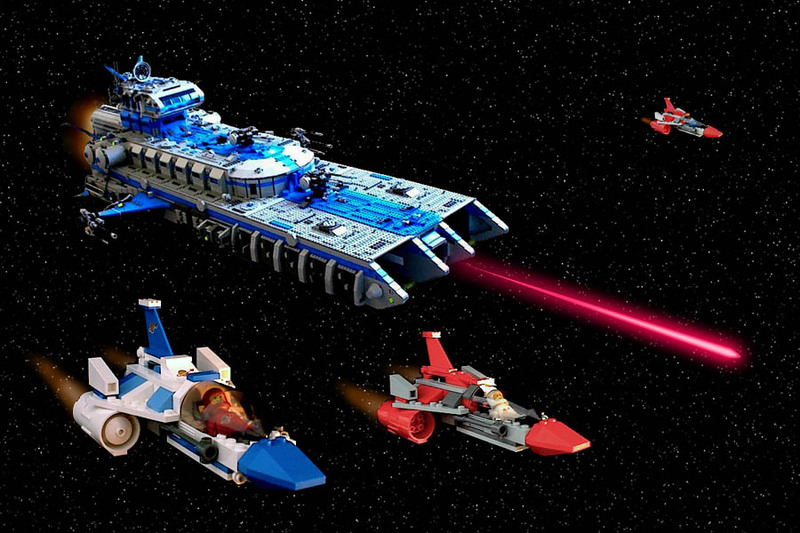 Gibraltar is a starfighter carrier in the Lego Space Force fleet. The model is built to minifigure scale and measures 186 studs long, 88 studs wide (at the wings), and 44 bricks tall. It can carry up to 10 starfighters or other small craft and has a crew of 22. It is the second largest spaceship I've ever built. Although Gibraltar is built similarly to my first carrier, I consider it a vast improvement over the first. It features a greater array of details, inside and out. Initially, I built the ship before I had the Lego Space Force theme in mind. I just liked the neat Classic Space logo and wanted to use it on my next big ship, not really thinking about how others regarded it. So I inadvertantly went Classic Space on this model but I decided to stick with it and make Lego Space Force a part of my Lego universe. I consulted the Grand Admiral regarding uniforms and ranks so that our universes could overlap. Enlarge image Gibraltar was built using large gray baseplates to create the huge flight deck. Although the baseplates greatly limited my design options, I didn't have to use a ton of gray pieces. Ultimately, the shape was very boxy but I didn't mind since this was a carrier. Enlarge image A head-on view showing the dual hanger bays and the centerline torpedo bay. Enlarge image A view from slightly behind showing the openings to the landing bay as well as the ship's propulsion systems. Enlarge image The side view gives a good idea of how tall Gibraltar was. Note the bare underside, one of the drawbacks of using the large baseplates. Enlarge image The flight deck exposed, showing the normal stowage of craft inside. Enlarge image This picture shows the breakdown of each section. From the left is the flight deck, then the main deck, the mid-deck and the command deck. Enlarge image The ship had 1 airlock, located on the command deck behind the captain's quarters. This door leads to the airlock. Enlarge image A view from above inside the airlock. Enlarge image The outer door open. Note the captain's quarters on the right (with the captain standing in the window). I used this same outer door design later on Dragonstar. Enlarge image Top view of the bathroom/shower area. Enlarge image The bridge. Seated in the center is the captain. In the foreground is the pilot and navigator. On the far left is flight control and on the far right is weapons. Enlarge image The captain's cozy quarters, located right behind the bridge. I like the placement of the captain's quarters on this ship. Enlarge image A group of crewmen with 1 of the ship's 4 escape pods. Each escape pods can hold up to 6 people. Enlarge image An exterior view of the starboard escape pods. Note the crewman at lower right blasting away at pesky, parasitic fleebnorks that cling to the hull and chew on the power couplings. Enlarge image The lead starfighter (because I didn't have the parts to make more than one). Ideally, all of the fighters would look like this. Enlarge image The black fighters were the attack variants armed with torpedos. Enlarge image The gray and red fighters were the stock fighters of the ship. I made 7 from the A-Wings I bought for the first carrier. Enlarge image A somewhat fuzzy view of the ship's galley. Note the robo-chef. Enlarge image Crew bunks and lockers along the wall. Enlarge image A full view of the interior layout of the main deck. From the left is the galley, then sickbay, the crew quarters, and the bathroom. Enlarge image The officers quarters in the mid-deck (the neck of the bridge tower). Check out the spacious, elegant accomodations! Enlarge image I think I had watched the movie "The Right Stuff" just before I took this picture. Enlarge image A close up view of one of the quad-laser turrets. Enlarge image The sickbay, complete with the red-headed doctor babe and the medical droid from the first carrier. Enlarge image Top view of the torpedo room. I built an articulated torpedo loading system. Enlarge image Another view of the torpedo room, operated by droids. Love the fighters do u have any instructions to it? I tried building one of the fighters but was very unsuccessful. i just love this ship! it is my favourite moc of all time! the size, shape, colour, everything is fantastic! this is the perfect spaceship! my fleet of big ships (3 of them and some smaller ones) would get demolished by one of these! just fantastic! this one should've been kept intact! brilliant best moc i have ever seen!! Hey, Daniel, I have a way to add at least some features to the underside of a base plate bottomed capital ship. Here is what you do to make them happen. You simply get a few LEGO bricks to jut out from the sides of the vessel and then get some LEGO plates along the length of those jutted out pieces. After you get a layer or two of plates, you can interlock some more LEGO plates along the bottom and then add things like engines, lifts, etc., along the bottom. It might take a lot of LEGO plates but I believe that is the only way that it can be done with at least some strength. Please let me know what you think of my suggestion, Daniel. Thank you for the comments. *thump as jaw hits ground* this is the sort of calibre that puts most people to shame and puts others into a determined frenzy. this ship owns all. keep building! When i first saw this my jaw dropped to the floor, IT IS SO COOL!!!!! VERY COOL!!! VERY COOL INDEED!!! It is the BEST spaceship I've ever seen! And I think you can make it be a very big dropship by removing the aircraft and putting the infantry. And don't forget the troop ramps. Good luck! Ok really how do you get all these legos its like insane please tell me if you could. very nice reminds me alot of B.S.G. with the loading bays. Amazing! This is my favorite Lego ship! It actually inspired me to build my own big Lego starship! any relation to the Battlefield 2142 map Camp Gibraltar? This inspires me to make my own ship, even if I don't have a zillion pieces like you do. But unfortunatly I have projects of my own to get done first. i agree with avpfreak, even though i would have bought it for more, if you lived in England and if i had the money.....which means that.....omg why didn't i think of it before...LDD! WOW! Hey, i would just like to say that it was this image found on Google that introduced me to MOC pages in the first place! For this i would like to say a massive thank you to Dan. Keep on building! this is extreamly good i would pay double the price for this just like one of the other models you did. so many pieces.... it makes my head heart because i cant build something that good. Dang dude. That is very well made. WOW!!! This is sooooooo cool! !I love the colours.This ship is amazing. An extraordinary creation. I don't know how you do it. The fighters are cool. yo sooo ill man even with every piece of lego i have i couls make nuthing that big pleaz tell me were u get ur bricks from. very good! I base all of my capital ship's insides off of it. keep up the good work! I...just don't know what to say. That's just amazing to say the least. Let's just say I'm 14, and you're basically one of my 'lego-heros' so to speak. Just...incredible. Great Ship. I have yet to find one better. This is certainly a great MOC. It has been inspiration to me for all my capitol ships!